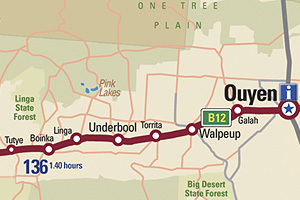 Walpeup (pronounced wol'pee'UP) is a locality situated on the section of the Mallee Highway between Ouyen and the South Australian border in the Sunraysia region. The place by road, is situated about 15 kilometres east from Galah and 8 kilometres west from Torrita. The township was settled quite late, a full Post Office opening on December 16, 1912. 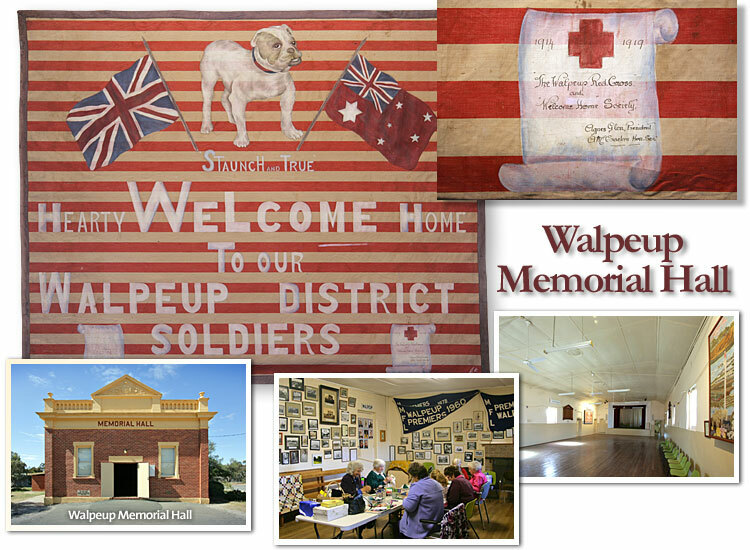 The main tourist attractions on offer in Walpeup are the Walpeup Memorial Hall (Glen St) and the Dryland Gardens (Creagan St). 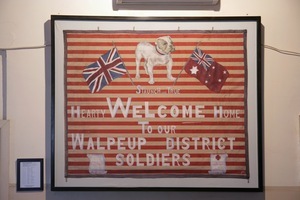 The Hall supper room houses a large collection of historic photographs including photographs of locals who attended either World War, a "welcome home" banner from the first world war - only found within the last 5 years and now restored and displayed - and a hand-sewn community Mural tapestry created in 1989. 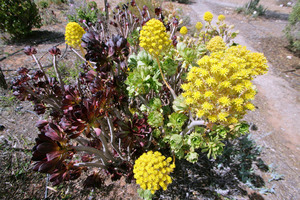 The Dryland Gardens are located on the corner of Glen and Creagan streets and display many native trees and shrubs from around the local region and Australia, particularly a large variety of Eremophilas. The Garden is tended by local volunteers. See other mallee flowers. Travellers can stay in their own caravans or tents at the Wayside stop located on the corner of Creagan Street and Murphy Road. The wayside stop contains a covered barbecue area as well as well maintained play equipment and lawn. Within 100 metres of the wayside stop is Shubert's Walk, a nature walk displaying many native trees and shrubs in their natural setting. Australia's Bicentennial Celebrations heightened local interest in our community's history; it was felt that the time was appropriate to make a pictorial record of Walpeup as we saw it in 1989. 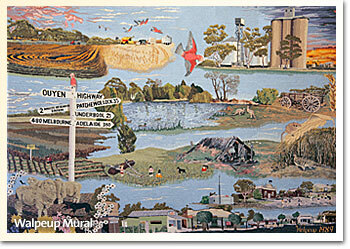 The Walpeup Mural Group was formed and funding from the North west Arts and Crafts Council made it possible for five members of the Group to visit southern NSW and Victoria where we saw a number of wall hangings executed in a variety of techniques. A mural measuring 6' x 8' was made up of 12 panels 2' x 2' was designed to be worked in tapestry stitches on canvas. The final design was worked predominantly in long stitch. The canvas used has 15 holes to the inch. It is worked mainly in tapestry wools. Three dimensional effects were added by overstitching and stitching over polyester wadding. The final design was planned to show the many facets of life in the Walpeup community. The coming of the channel water enabled sheep to be introduced with the added bonus of the Walpeup Lake. The contribution of the Mallee research Station is shown by the trail plots. The signpost emphasizes our comparative isolation even today. Some of the flora and fauna of the Mallee are included. Wildflowers show are Helgania, White Ti-tree, Everlasting Daisy and Pink Fringe Myrtle. The role which sport plays in the district is acknowledged by the figures outside the Memorial Hall, with the school, C.F.A. shed and Catholic Church included in this session. The streetscape of our township is depicted in the bottom section. The "Seat of Wisdom" outside the Walpeup Store is a local institution. The Chopping Block (now demolished) was formerly Sly's butcher shop. Mr. "Jock" Rowan, a resident since 1922, and his dog "Sooner" are shown with his Holden Ute. The following statistics may be of interest: The completed mural has utilised 9,500 metres of wool, which represents 230 colour toning. The mural represents in excess of 7,000 hours of stitchery done in a voluntary capacity. Six successful two day workshops where held with Kirsty. In between these workshops we held mural days on the second and fourth Monday of each month. On these days all members of the community were encouraged to participate. Special arrangements were made to involve the school children. Visitors were most welcome to come along and see the progress of the mural and to "put in a stitch".